If you're wondering what it's like to fly British Airways First-Class from Gatwick on their Boeing 777 then read on and see how Jess and I got on during a recent trip to the tropical island of St Lucia. Don't have time to read me rambling on? Then lucky for you I made a quick 1 minute video where you can get a rapid glimpse of what you can expect on British Airways most premium cabin. St Lucia is one of the very few tourist routes that BA offer a First Class service too, the others being Barbados, Bermuda, Grenada, Port of Spain (you fly to St Lucia first then onto Port of Spain) and San Jose. All of these routes operate from London Gatwick South terminal where British Airways operates it's age old dilapidated Boeing 777 fleet featuring a very heavily worn cabin from economy right up to First Class (seriously the economy/premium economy on these planes are an absolute joke buts lets save that for another time). So, is it worth the £3000 price tag for a return flight in First? Well before I give my verdict let's look at what you'll get with your elusive golden ticket. Having flown First-Class from both Gatwick and Heathrow I can tell you that the First-Class experience is nowhere near as good at Gatwick (private First Class check in & Concord Lounge at Heathrow trump everything at Gatwick). 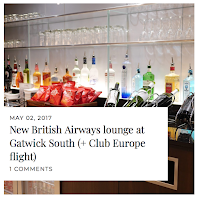 On saying that the new First Lounge at Gatwick is very modern with a nice selection of both buffet and à la carte food and premium self-service alcohol (Laurent Perrier Grand Siecle Champagne). The lounge caters not just for First Class passengers but Gold One-World members too so at around 10AM when most the flights are departing it can start to feel very crowded. Relaxing with a Champagne breakfast in the lounge we were suddenly interrupted with the panic our flight was about to board (well I had a mild panic, Jess however was enjoying her breakfast too much to care). Arriving just in time for First Class passengers to be called we made our way onto the aircraft via the bridge where I followed Jess by turning left only to be stuck on her side of the plane. After some awkward, shamefaced reshuffling we both took our seats. 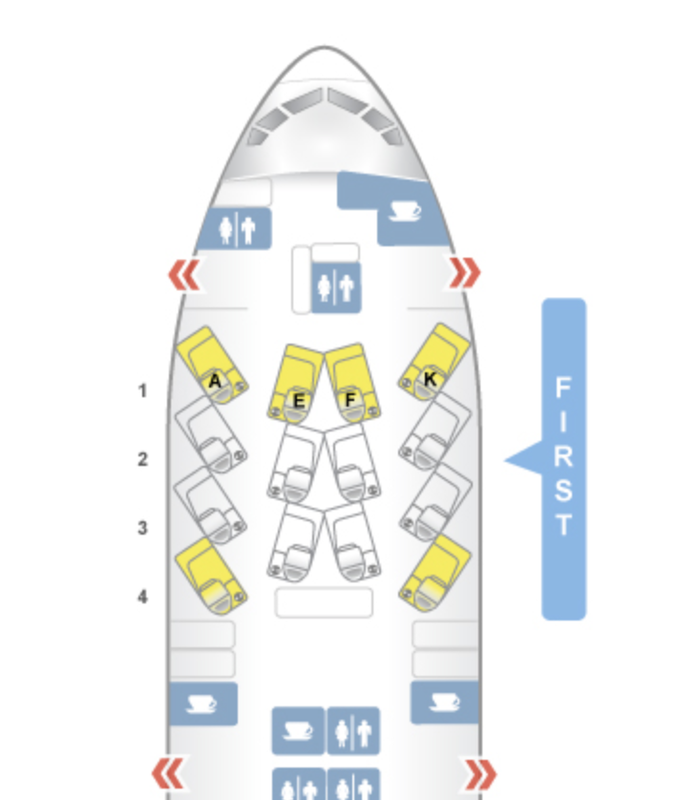 On our outbound flight, we sat in the centre two seats (2E/2F) which are great when flying as a couple since there is a window between the two for chatting. If you are travelling alone there is a divider that you can close if you want some peace from whoever your neighbour turns out to be. On the inbound flight Jess must have had enough of my amazing patter and decided we would try the bulkhead seats (3K/4K) which give you much more privacy and of course two windows to check the view from. The latest first class seats can be found on the Dreamliner and Airbus A380 but besides from having a fresh new feel and larger screen the seats are almost identical. Back on the Boeing 777 the seat and cabin could probably do with an update or at least good deep clean and some maintenance. here were signs of grime around those awkward access areas, the mechanism for the table was slightly damaged on Jess's seat and several passengers had problems with their screens. The cabin was definitely not dirty, in fact it was as clean as you would expect any cabin to be but if you're paying £3000 for a flight you're probably expecting something a little newer and less tired. So, no Concord Lounge, the seats needing a deep clean and cabin generally looking a little old and worn? Well thankfully that's where the moaning stops because where British Airways exceeds its self is in their service. From the moment we arrived at the airport to leaving the staff were incredible and with some of the best food and drink available at 40,000ft you will forget all about those small negatives. Once we located our seat one of the First Cabin Hosts presented us with some champagne to enjoy while the aircraft was prepared for departure. Once in the air there was more champagne with warm nuts while the amenity bags were handed out. 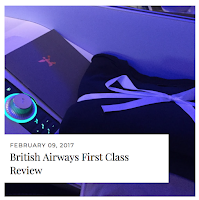 British Airways have recently switched their First class cabin to using The White Company linen for bedding and offering his and hers Liberty's amenity bags packed full of products to keep you feeling fresh during the flight. Jess was more excited about these two changes than me as I'd never heard of either brand but she assures me they are excellent choices. We were already feeling like a million dollars eating fancy heated nuts and drinking champagne when the host arrived with the in-flight menu offering fine dining at 40,000 feet. Again, this is where BA excels and offers an incredible menu of food leaving you wondering how the hell did they manage to serve this sort of grub on a plane. If you're travelling as a couple then British Airways offers an option to dine together. This is done by one person sitting on the stool at the end of the chair with the other sat in their own chair. While this is a nice touch it can get a little uncomfortable being perched on the stool for an hour, top tip if you do go for dining together make sure you're the one in the proper chair. After dinner, the cabin crew will come round with some British Airways First Class embroidered pyjamas but if you're like Jess and want to get into mega relaxing mode straight away then you can ask the cabin crew for them right after take-off. On our return flight she was actually in her PJs within minutes of us being on the aircraft, having asked for them before take off and changed in to them immediately. Making the most of every minute of comfort. There is no need to make your own bed here, that's for Club World passengers to worry about. When you head off to get ready for bed the cabin crew will magically transform your chair into an awesome 6ft 6inch bed with white company linen looking like something straight out of the Ritz. Cue a little whisky night cap (well an afternoon cap) and then it's time to crash out. Having flown Club World a few times I can say that the bed is much more comfortable. I managed to get a good couple of hours of deep sleep on the outbound flight and during the overnight inbound flight we both got a good 6 hours. As with flying any First-Class route with British Airways you will receive priority baggage tags to ensure your bags are first off the plane at the other end, you will have priority security thought London Gatwick and over in St Lucia. The only thing you don't get is priority passport control but hey it can be quite nice to stretch your legs for a little bit after a long flight. That is unless you're flying to the USA where getting thought passport and customs takes up half your holiday. Cons: These Gatwick aircrafts really do need an update and deep clean in the cabins to justify the huge costs of flying First. The cabins should be cleaned and maintained to the same standard as their Heathrow aircraft's. On a cash ticket flying First Class to St Lucia will set you back around £3000 for a return fare. This is almost double the cost of flying Club World. Whether it's worth it or not depends on if you value the privacy and extra comfort for the premium. That or you could drink your weight in Laurent Perrier Grand Siecle Champagne, (£125 a bottle). Using Avios you can fly First Class return to St Lucia for 170,000 Avios per person + £550 in taxes. Remember if you are flying as a couple then using a companion voucher would mean two people could fly for 170,000 Avios and just £1100 in taxes. Great ....You have beautifully presented your thought in this blog post. I admire the time and effort you put into your blog and detailed information you offer about business class deals this topic!! Hey Adrian thanks for the comment, I should have clarified that it must be a direct flight from Dublin (I didn't actually know you could do it from Shannon too) to the USA where you can use the pre-clearance. In fact, it’s not really relevant to have that statement in this post as it could be miss-leading since you cannot utilise the pre-clearance when flying on BA First through London from Dublin so I have decided to deleted it. Cheers again for bringing this up so I could edit it and hope you enjoyed the post.